Successfully Added Nanum II Car Air Humidifier - Plug And Play, Adjustable Bracket, 180 Degree Humidification, Aroma Diffuser, 2 USB Ports (White) to your Shopping Cart. Allowing you to add essential oils this miniature car air humidifier simultaneously works as an aroma diffuser. Increase your mood and reduce anxiety while making your car smell fresh - with the Nanum II Car Air Humidifier you will breath fresh and clean air all the way along. Holding 50ml of water at once this air humidifier provides you with two hours of continuous usage time. Simply add more water once it has run out and you are ready to enjoy your clean air and pleasant aroma during the entire trip no matter the distance. With its adjustable bracket, the Nanum II car air humidifier is guaranteed to fit any car out there. 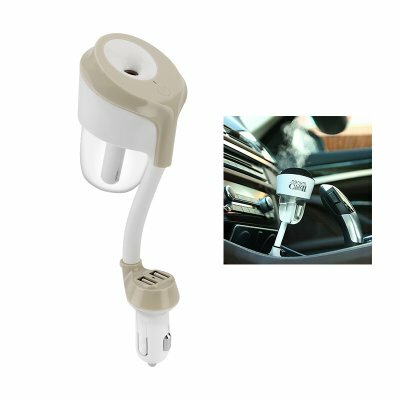 Simply plug in the device into your cigarette lighter socket, adjust its bracket, and you are ready to enjoy your fresh and purified air. Holding up to two USB ports this air purifier additionally offers the possibility to charge multiple smartphones or other mobile devices – ensuring you that you will always have the juice to stay connected to your loved ones while you are out on the road. No matter in what sort of climate you live, the Nanum II Car air humidifier significantly increases the quality of the air and reduces allergic reactions and illnesses alike. This little air purifier is the perfect car accessory out there that lets you enjoy a fresh aroma while staying healthy – allowing you to enjoy your upcoming road trips to the most.